I know what you're thinking, but this isn't an article about Roseanne Barr: it's about crude oil. I'd like this post to mark the official announcement that I will be taking "chart requests" on weekends. Please use the comments section of this post to request specific charts. I'll try to get to at least a couple of your charts each weekend. Your blog has been up for a whole week now, and I have yet to see a single chart of crude oil. Wut up wit dat, yo? Well, little Billy of Arkansas Tennessee, you're in luck, because today we're charting crude oil! Crude is one of the few commodities that can be accurately tracked at cycle degree. As such, I believe we topped Supercycle I back in 2008. By the way, despite the current "peak oil" fearmongering, this argues that oil will likely be with us for a long time to come -- although it's prolly gonna get way 'spensive at some point, in Supercycle III (of course: doesn't everything), there is no reason to believe that the market will continue to tighten in the foreseeable future. 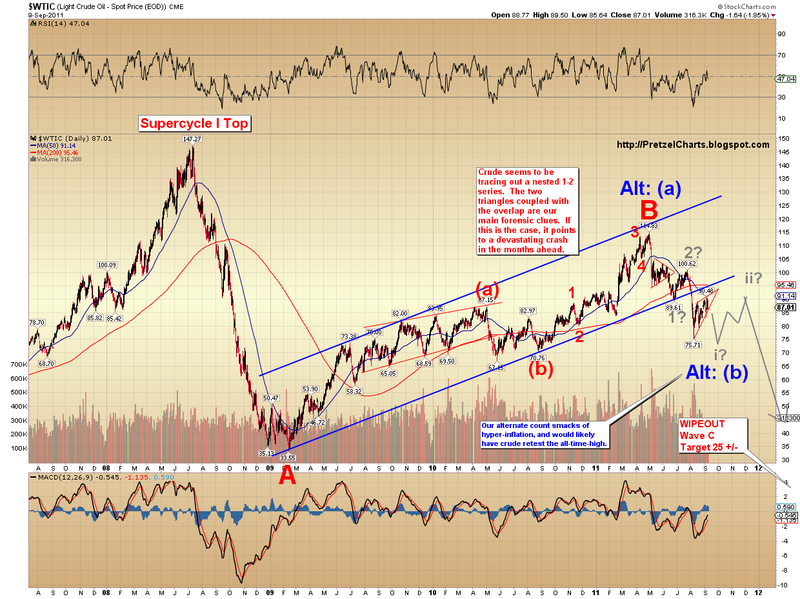 We are currently undergoing a correction in Supercycle II. It remains to be seen if this correction will be A-B-C for ALL OF wave II, or if this will be A-B-C of a larger A-B-C... but it doesn't really matter as far as the immediate future is concerned, so we'll drive our gas guzzlers across that bridge when we come to it. The first thing we notice about this chart is the giant parabolic of wave V and the subsequent wave A crash of 2008. This is fairly typical of commodities as they often form extended fifth waves which retrace quickly. Add that to the fact that this is a crash not of primary degree, but of Supercycle proportions, and you get the picture. The second thing we notice is that wave B appears to be complete, with three farily-clean waves that count nicely in a 5-3-5 pattern. C-down looks like it's in the early phases. Assuming that we are in wave C now, that leads us to a count of 1-2 complete, nesting what will likely become a smaller i-ii count. It is important to note that we arrive at this nested count out of necessity, based on the overlap in the wave structure and the placement of the two triangles. Now, we are operating under the presupposition that this is wave C, and our preferred 1-2 count hinges on that. Our alternate, the potential bullish count, would have us in wave (b) now, with new highs to follow in (c) of B. The market is currently in a state of equilibrium (since either count is viable) and is, in essense, issuing a direct challenge to Emperor Bernanke as to how far he's willing to take the destruction of the dollar. In the alternate count, we can see that which we already know: the only thing monetary policy could create here would be another, larger bubble, since there is no true creation of wealth except through production. The wave C crash would still follow that bubble as surely as the sun follows the rain; all the printing press could "accomplish" would be to delay the crash for a time... and ultimately the delay would only make the crash that much more painful. So our fate is sealed one way or the other, which appears to be the nature of choosing certain paths in life. Once you pass the point of no-return, the road leads to a certain logical conclusion no matter what you do thereafter. We have clearly passed the point of no-return in this particular economic experiment. Back to the preferred count: Wave i of the preferred count looks like it needs a slightly lower low to complete, which should then generate a month or two of snap-back rally before the wipeout phase hits. It remains to be seen whether the Fed will decide to prolong the agony or not, and their actions could potentially shift our alternate count into the preferred role.